Our youth classes are hard work rewarded with fun, and our goal is to bring out the best in each student. Each student's individual strengths are praised and all students are encouraged to develop into strong, self-controlled and confident adults. 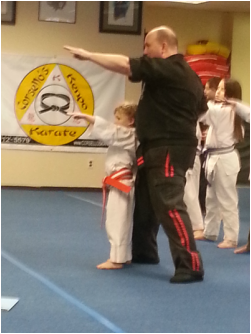 Academics are stressed as part of each child's Kenpo training as well. Our youth classes are divided into two age groups: Little Eagles (ages 4 - 7) and Hawks (ages 8 - 14). The Hawk's curriculum is a modified version of the adult program to allow the younger students to learn and understand the fundamentals of Kenpo with material appropriate for their age group. The Little Eagle's curriculum is a modified version of the Hawk's curriculum to match their mental and physical abilities, and focuses heavily on character development. Private lessons are available for all ages and belt levels. Speak to a black belt instructor for more information. 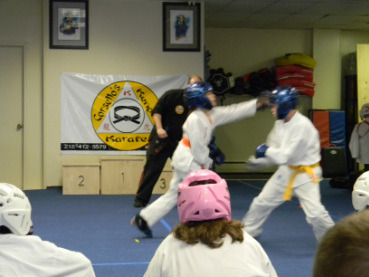 *Forms/sparring classes are only for those yellow belt and higher, and for those with full sparring gear.